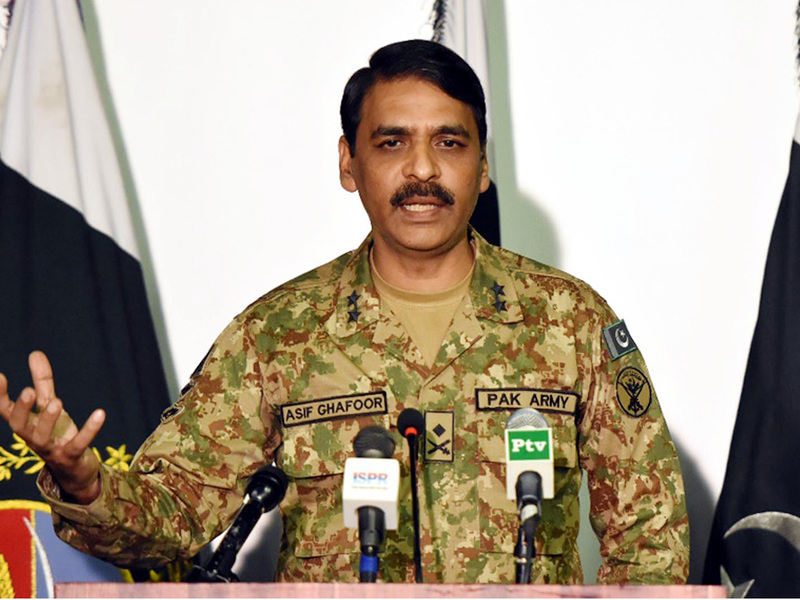 Inter-Services Public Relations (ISPR) Director General (DG) Major General Asif Ghafoor on Tuesday said that the decision to ban Jamaatud Dawah (JuD) and Falah-e-Insaniyat Foundation (FIF) was taken back in January before the Pulwama incident. While speaking to a private TV channel, the ISPR DG said that the National Action Plan (NAP) could not be implemented as it should have been. He cited financial woes of the country as one of the reasons for the lack of proper implementation of NAP. He also rejected the notion that the army was taking dictation from anyone, adding that any improvement in the system would only benefit Pakistan. Talking about Indian aggression in the wake of the Pulwama incident, he said that after the incident, Prime Minister Imran Khan offered to carry out an investigation into the incident but instead of responding to the premier’s peaceful gesture, India violated the Line of Control (LoC) on February 26. He also said that anyone found guilty of involvement in the Pulwama incident would definitely be punished. The military spokesman further said that now is the time for Pakistan to be united because unity will take the country to its rightful destination. He also called on India to decide the course it wants to tread on because the future depends upon it. Pakistan’s military has pointed out that a two prong strategy was made to fight terrorists and terrorism. In kinetic domain, Operation Zarb-e-Azb was launched in June 2014. To support this operation a 20-point NAP was announced. NAP was aimed to counter violent extremism, hate speech, hateful literature and de-weaponisation to address the root causes of extremism. NAP’s point three specifically deals with action against proscribed organisations. Operation Radd-ul-Fassad was launched on Feb 22, 2017, with four cardinals, including eliminating residual threat of terrorism, country wide counter-terrorism operation, de-weaponisation and explosive control. It has also pointed out that border management as perusal of NAP is a hall mark of Operation Radd-ul-Fassad. Objectives of kinetic operations were achieved to a large extent which brought down terrorism. Previously due to commitment in kinetic operations, efforts for NAP remained waiting.The army chief, during his speech on September 6, 2017, had categorically announced that monopoly of use of force rests with the state. Similarly, to counter hybrid threats, PECA was strengthened and action against hate speech and literature was ensured. Arrest of many inciting religious violence is testimony to that where more than 4,000 such people were arrested. The army chief, while making speech at Munich Security Conference, had said that that terrorists thrive on our division and feed on our inability to come together against them. He had called upon the people to deny them these chinks in the collective armour. He had said that lack of focus and commitment and individual effort will not take us anywhere. The military has also said that now, the focus is on the implementation of NAP to address the root cause of extremism and de-radicalisation of the society. NSC meeting held on November 6, 2018 had also concluded that the path to future lies in the rule of law. So, the military has stated, the recent actions are in line with the state policy being pursued rigorously since 2014 and nothing to do with any outside influence. The ISPR DG has been saying same thing in presser that Pakistan will move towards peace, stability and prosperity and will not allow anyone to use its soil against state interest.